Winter salads are as colorful and appetizing as warm-weather ones. Miriam shares two recipes here. The word “salad” evokes a warm afternoon, sunshine streaming in through the kitchen window and a big ceramic bowl filled with chopped tomatoes and cucumbers. At least, it does to me. But it’s the wrong season for that picture right now. In winter, tomatoes and cucumbers are expensive. I turn to root vegetables, sprouts, and wild edibles to satisfy the yearning for salad and to round out a hot meal. These winter salads are so flavorful that they need little more than olive oil and vinegar as dressing. Thin strips of orange peel make the difference between a boring salad and one that wakes your taste buds up. A light vinaigrette dressing offsets the earthiness of the beets. How to zest an orange: the little hand-held lemon zester is a great device, but lacking one, just grate the orange lightly, turning it often so as to avoid the bitter white pith. Wash the orange well with warm water and soap before removing the zest, unless it’s organic. 1 large beet, or two smaller ones. There should be about 3 cups of cooked, sliced beets. ½ teaspoon salt, or more to taste. 1. Put the sliced onion into a small bowl. To it add the orange zest, olive oil, vinegar, honey, and salt. Cover and allow the onion to marinate while you’re cooking the beets. 2. Quarter the beet (halve two smaller ones) and cook the pieces in water to cover till tender. 3. Allow the beets to cool slightly and peel them. Grate them into a bowl or cut them by hand to the size and thickness you desire (thinner is better). 4. 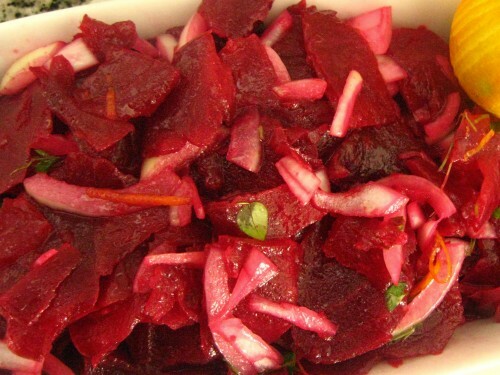 Mix the marinated onions, with all their juice, with the beets. Add the chopped parsley or chickweed. 5. Allow the salad to rest, covered and in the fridge, for at least an hour before serving. Chickweed, a tasty wild edible, plays a larger role in this salad. 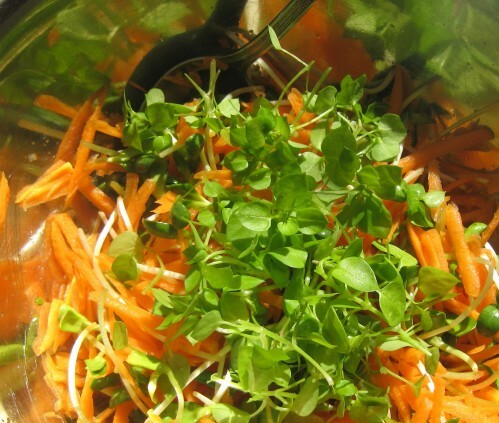 The hearty taste of sunflower seed sprouts complements the sweetness of the carrots. Just mix everything up together gently. This salad needs no more than a drizzle of good olive oil, salt, and a little lemon juice as dressing.